Nature shows set in Africa often show rhinos and other large mammals with small birds on their backs. They're oxpeckers — like the Yellow-billed Oxpecker pictured here. This relationship was long held up as a textbook example of mutualism. Oxpeckers feed almost exclusively on whatever they find on the mammals’ backs, and the mammals are freed of potentially harmful parasites. But in Zimbabwe in 1999, an experiment with two groups of cattle — those with oxpeckers on their backs and those without — told a different story. Oxpeckers – Benefactors or Parasites? Nature shows set in Africa sometimes show rhinos and other large mammals with small birds riding their backs. They're called Oxpeckers. They're poking into ears, plucking ticks, removing dead skin and mucus - generally doing a pretty thorough cleaning job. 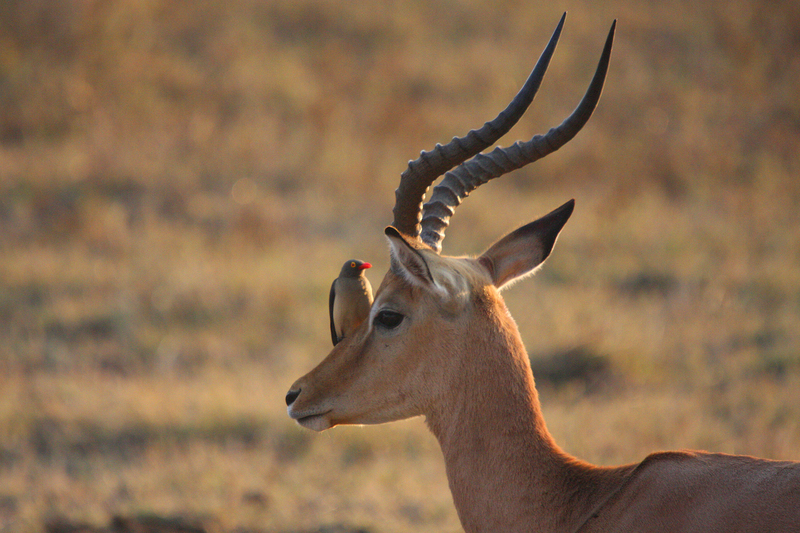 This oxpecker/large mammal connection was long held up as a textbook example of mutualism – two animals, benefiting equally. Oxpeckers feed almost exclusively on what-ever they find on the mammals’ backs. And the mammals are freed of potentially harmful parasites such as ticks. But in Zimbabwe in 1999, a careful experiment with two groups of cattle – those with oxpeckers on their backs and those without – told a different story. For a start, cattle without the oxpeckers had no more ticks than those that had the birds. In fact, oxpeckers seem to target those ticks already full of mammal blood and ignore others. The blood in the tick seems to be the valued food. Oxpeckers also reopen wounds on their hosts and imbibe fresh blood. This may impede healing or, some suggest, help clean the wound and benefit the mammal. Does this make the oxpecker more parasite than benefactor? At this stage, the jury's still out. Red-billed Oxpecker  recorded by Myles E. W. North in Kenya's Rift Valley, July 17th 1964, provided by The Macaulay Library of Natural Sounds at the Cornell Lab of Ornithology, Ithaca, New York.